Australia's flight to victory was never smooth. But, more than 130,000 Australian airmen fought Japan from the Pacific War's first hours in 1941 to its last in 1945. CBI - China: Day 89 of 142 of the 1st Battle of Hebei. Spain: Day 257 of 985 of the Spanish Civil War. Spain: Day 622 of 985 of the Spanish Civil War. CBI - China: Day 267 of 2,987 of the 2nd Sino-Japanese War. Day 52 of 124 of the Battle of Henan. Day 7 of 15 of the Battle of Taierzhuang. For the first time in this battle, Chinese aircraft appear, destroying vehicles and attacking troop concentrations. Day 7 of 39 of the Battle of Xuzhou. ETO: A British-French-Polish agreement is made, a mutual guarantee of each others' borders. This arises from tension between Germany and Poland over Danzig. Eastern Front: Day 8 of 13 of the Slovak-Hungarian War, aka the Little War. CBI - China: Japanese troops occupy several of the Spratly Islands west of the Philippines in the South China Sea, setting them up for submarine bases. CBI - China: Day 632 of 2,987 of the 2nd Sino-Japanese War. Day 14 of 54 of the Battle of Nanchang. ETO - UK: First Lord of the Admiralty Churchill acknowledges the Soviet neutrality in the European War. ETO: France decides not to ratify the British proposal to mine the Rhine River. The UK responds by threatening to abandon the plan to mine Norwegian waters. Finland: Finland cedes about 10% of its territory to the USSR, according to the peace treaty ending the Russo-Finnish War. Eastern Front: Germany begins supplying weapons to the Soviet Union. CBI - China: Day 998 of 2,987 of the 2nd Sino-Japanese War. Day 137 of 381 of the Battle of South Guangxi. Japan installs a puppet government in Nanking under the leadership of Wang Jinwei. Day 63 of 67 of the Battle of Wuyuan. Fresh Chinese troops attack the city and the Japanese begin to evacuate. USA: The US and the UK agree on military coordination in the event the US enters the war. Afterward, the US seizes 2 German, 26 Italian and 35 Danish ships in US ports. Atlantic: German sub U-69 sinks British ship COULTARN 300 miles southwest of Iceland. Atlantic: German sub U-124 sinks British ship UMONA 90 miles southwest of Freetown, Sierra Leone. Atlantic: The British RAF launches planes after sundown to attack German cruisers SCHARNHORST and GNEISENAU at Brest, France. ETO - UK: Day 206 of 258 of the Blitz. Germany: Hitler tells his assembled commanders that he intends to exterminate communism for all time. MTO - Italy: The British sub HMS RORQUAL sinks the Italian tanker LAURA CORRADO 33 miles northwest of Trapani, Sicily. MTO - Libya: The German Afrika Korps begins their offensive in North Africa to recapture lost territory of Mersa Brega. East Africa: Day 294 of 537 of Italy's East African campaign in the lands south of Egypt. East Africa - Eritrea: Day 54 of 56 of the Battle of Keren. CBI - China: Day 1,363 of 2,987 of the 2nd Sino-Japanese War. Day 17 of 27 of the Battle of Shanggao. CBI - Thailand: Day 181 of 221 of the Franco-Thai War (Vichy France vs Thailand). Atlantic: Day 76 of 169 of Germany's Second "Happy Time," during which U-boats sink 609 Allied ships with little risk. The RAF makes a second unsuccessful attempt to sink the German battleship TIRPITZ while in port at Trondheim, Norway. Germany: French Jews begin arriving at Auschwitz Concentration Camp, with the first transport originating from Compiegne. Russian Front - North: Day 204 of 872 of the Siege of Leningrad. Russian Front - North: Day 51 of 102 of the Battle of the Demyansk Pocket, another failed attempt to break the siege at Leningrad. Russian Front - North: Day 67 of 103 of the Battle of the Kholm Pocket. Another attempt to break the siege at Leningrad. Russian Front - Center: Day 82 of 103 of the Battle of Vyazma, Russia. Russian Front - Center: Day 82 of 103 of the Battle of Sychevsk, Russia. Russian Front - Center: Day 28 of 49 of the Battle of Rzhev, Russia, a diversion to pull more German troops away from Moscow. Russian Front - South: Day 152 of 248 of the Siege of Sevastopol, Crimean Peninsula. CBI - Burma: Day 107 of 164 of Japan's Invasion of Burma. Japanese troops engage the Chinese troops who were defending Toungoo. CBI - China: Day 1,728 of 2,987 of the 2nd Sino-Japanese War. Day 97 of 99 of the 3rd Battle of Changsha. PTO: The Pacific War Council (Britain, Australia, Canada, China, New Zealand, Netherlands, Philippines and the US) creates the Pacific war theaters, complete with area assignments. PTO - Borneo: Day 105 of 107 of the Battle of Borneo. PTO - Malaya: Day 40 of 357 of the Battle of Timor Island. PTO - Philippines: Day 113 of 152 of the 1st Battle of the Philippines. 5th Air Force provides air support. Atlantic: British light cruiser HMS GLASGOW intercepts the German blockade runner REGENSBURG, whose crew scuttles the ship. ETO - UK: The British super-gun "Bruce" is fired for the first time from a battery in England behind St Margarets at Cliffe, Kent. Although it achieves the projected range of 62.5 miles, after 30 shots the inside of the barrel becomes so worn that the ribbed shells soon failed to catch in the grooves. Bruce is unable to make any further contribution to the war effort. ETO - Netherlands: The RAF bombs the Philips factory in Eindhoven. Germany: A transport of 2,501 Jews from Thessaloniki, Greece, arrives at Auschwitz. 312 men and 141 women are registered, while the remaining 2,048 are immediately gassed. Russian Front - North: Day 569 of 872 of the Siege of Leningrad. Russian Front - North: Day 49 of 51 of the USSR's Operation POLAR STAR, a failed offensive north of Leningrad, hoping to take the southern shore of Lake Ladoga, Russia. Russian Front - North: Day 330 of 658 of the Siege of the Kholm Pocket, USSR lays siege to the Kholm Pocket but the Germans hold out for a about a year and a half. Russian Front - Center: Day 29 of 30 of the 3rd Battle of Rzhev-Sychevka, Russia. MTO - Tunisia: Day 134 of 178 of the Battle of Tunisia. RAF and US Air Forces provide Allied air support. Day 8 of 16 of the Battle of El Guettar. US 1st and 9th Infantry Divisions attack the Italian positions at Hill 369 near El Guettar with little success. British 8th Army breaks through at the Gabès Pass and make contact with the enemy's new line along Oued el Akarit. CBI - Burma: Day 100 of 104 of the 1st Battle of Arakan. US 10th Air Force provides air support. CBI - Burma: Day 51 of 79 of the Allied Operation LONGCLOTH. CBI - China: Day 2,093 of 2,987 of the 2nd Sino-Japanese War. PTO - Alaska: Day 297 of 435 of the Battle of Kiska, Aleutian Islands. US 11th Air Force warplanes attack the Japanese on Kiska and Attu Islands. ETO - Germany: Day 134 of 135 of the Battle of Berlin (RAF bombing campaign). 572 Lancasters, 214 Halifaxes and nine Mosquitos (795 aircraft in total) are dispatched. The Germans correctly identify Nuremberg as the target, due to unusually clear weather and the formation of contrails at a lower than usual height. The first fighters appear just before the bombers reach the Belgian border and over the next hour 82 aircraft are lost on the approaches to Nuremberg. ETO - Netherlands: US 8th Air Force P-47s bomb the airfields at Eindhoven and Sosterburg. Russian Front: Hitler fires Generals Kleist and Manstein, replacing them with Schorner and Model. Russian Front - North: Day 58 of 191 of the Battle of the Narva Isthmus, Estonia. Both German and Soviet troops in the Baltic region remain in a defensive position. Russian Front - South: Day 98 of 113 of the USSR's Dnieper-Carpathian Offensive in southwestern Ukraine. Russian Front - South: Day 27 of 45 of the Battle of Chernovtsy, Ukraine. Russian Front - South: Day 6 of 15 of the Battle of Kamenets-Podolsky Pocket, Ukraine. Russian Front - South: Day 25 of 44 of the Battle of Snigirevka, Ukraine. Russian Front - South: Day 5 of 20 of the Battle of Odessa, Ukraine. MTO - Italy: Day 74 of 123 of the Battle of Monte Cassino. Bad weather keeps both sides fairly idle. MTO - Italy: Day 69 of 136 of the Battle of Anzio. Bad weather keeps both sides fairly idle. CBI - Burma: Day 92 of 99 of the 2nd Battle of Arakan. CBI - Burma: Day 26 of 166 of the UK's Operation THURSDAY. Japanese troops continue attacking the BROADWAY site. CBI - Burma: Day 21 of 147 of the Battle of Myitkyina. US 10th Air Force provides air support. Day 3 of 10 of an action at Nhpum Ga Ridge by the infamous "Merrill's Marauders" against 1,300 Japanese. CBI - China: Day 2,459 of 2,987 of the 2nd Sino-Japanese War. CBI - India: Day 23 of 118 of the Battle of Imphal-Kohima. Japanese troops lay siege at Imphal as they cut the road to the north. PTO - New Guinea: Day 31 of 80 of the Battle of the Admiralty Islands. 5th Air Force provides air support. US troops land on Pityilu. PTO - New Guinea: Day 194 of 219 of the Battle of Shaggy Ridge. 5th Air Force provides air support. PTO - New Guinea: Day 107 of 597 of the Battle of New Britain. US 13th Air Force provides air support. PTO - Palau Islands: The Japanese repair ship AKASHI is sunk by US carrier planes north of Urukthapel Island. PTO - Solomon Islands: Day 151 of 295 of the Battle of the Bougainville Islands. US 13th Air Force provides air support. ETO: Anti-Nazi German pilot Hans Fey intentionally lands his ME-262 A-1 "Schwalbe" (Swallow) jet fighter at the American held Rhein/Mein airdrome and hands it over in full working condition, giving the Allies their first ever close-up look at one. Equally important, Fey brings his testing and development experience, including 80 hours flying in German jets. 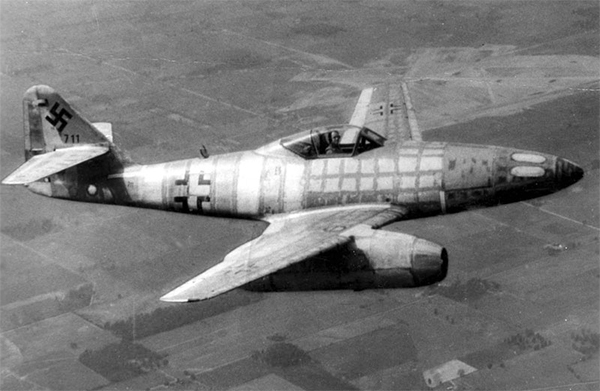 Development of the ME-262 began before the war, but was delayed by technical problems with the jet engines and the belief that the war could be easily won by Germany with conventional aircraft. 1,430 were eventually built, though only 200-250 ever made it to frontline squadrons due to shortages in fuel, pilots and parts. It first saw action in August of 1944. The ME-262 required concrete runways, so Allied leaders singled out jet bases for heavy bombing, successfully destroying many of the jets on the ground. ETO - France: Day 243 of 284 of the Battle of Brittany. ETO - France: Day 197 of 236 of the Siege of Dunkirk. ETO - Germany: Day 24 of 46 of the Battle of the Ruhr Pocket. 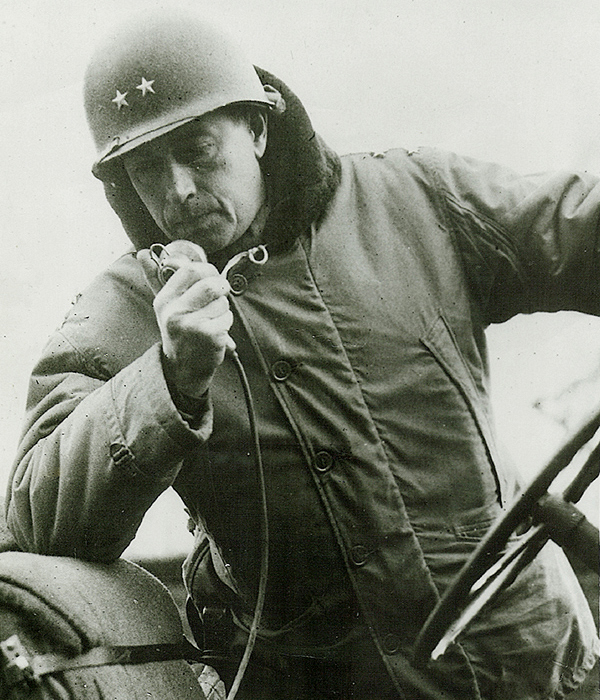 The US 1st Army begins a 3-day battle for Paderborn, during which Major General Maurice Rose is killed in action. Major General Maurice Rose was a fighting general who constantly put himself on the front lines in harm's way. He was the highest-ranking American Jewish officer ever killed in battle, and the only individual casualty to spark a War Crimes Investigation. In 1943, Rose negotiated and accepted the surrender of the German Army in Tunisia, the first large-scale surrender to an American force during WWII. At the Battle of Carentan in June 1944, he saved the 506th Parachute Infantry (of Band of Brothers fame), and might very well have saved the entire Normandy beachhead from a catastrophic German counterattack. His brilliant, daring, and aggressive defensive tactics during the Battle of the Bulge prevented an enemy breakthrough to the Meuse River and beyond, thereby frustrating the German advance. On 30 Mar 45, a few miles south of the city of Paderborn in a rural forest area, General Rose was riding at the front of the Task Force Welborn column. The front of this column consisted of his own jeep, a jeep in front of him, a tank at the lead of the column, an armored car behind him, and a motorcycle messenger bringing up the rear. Suddenly they began taking small arms fire as well as tank and anti-tank fire. General Rose, along with the other men, jumped into a nearby ditch with his Thompson sub-machine gun as the lead tank took a direct hit and was destroyed. When they realized that they were being surrounded by German tanks they re-entered their jeeps and tried to escape. They drove off the road and through a nearby field before heading back toward the road. When arriving back at the road they realized it was occupied by numerous German Tiger tanks. The lead jeep gunned its engine and narrowly made it past the tiger tanks and escaped to the other side. The driver of General Rose's jeep attempted to do the same but one of the German Tigers turned to cut them off and as Rose's jeep was passing the Tiger tank wedged the jeep against a tree. The top hatch of the Tiger tank flung open and a German soldier appeared pointing a machine pistol at the group in the jeep. General Rose reached toward his pistol holster (either to throw it to the ground or in an attempt to fight back). The German soldier shot him several times with at least one round hitting Rose in the head. It is believed that the German tank crews never had any idea that the man they killed was a general because sensitive documents, as well as General Rose's body, were not removed from his jeep. ETO - Germany: US 8th Air Force bombs the port cities of Hamburg, Bremen and Wilhelmshaven. The Valentin U-boat pens near Bremen are targeted with 60 rocket boosted, concrete piercing, bunker busting "Disney Bombs" but only one hits its mark. This is the third of four "Disney Bomb" missions of the war. Russian Front - Finland: Day 197 of 223 of the Lapland War. Finland and Russia have joined forces to kick the Germans out of Finland's most northern province. Russian Front - Center: Day 167 of 206 of the Battle of the Courland Pocket in Latvia. The Germans evacuate their last Oder River bridgehead at Wollin, Germany. Russian Front - Center: Day 65 of 75 of the Battle of Königsberg, East Prussia (now Kaliningrad, Russia). Russian Front - Center: Day 49 of 54 of the Battle of East Pomerania, Germany. Danzig falls to the Soviets. Russian Front - Center: Day 46 of 83 of the German Siege of Breslau (today Wroclaw, Poland). The Soviets surround Breslau and Glogau. Russian Front - Center: Day 16 of 17 of the USSR's Upper Silesian Offensive in Germany (today Poland). Russian Front - South: Day 5 of 21 of the Battle of Nagykanizsa-Körmend, western Hungary. Russian Front - South: Day 18 of 34 of the Battle of Vienna, Austria. The Soviets cross the Hron and Nitra Rivers in Czechoslovakia and into occupied Austria near Koszeg, Hungary. MTO: US 15th Air Force bombs targets in Austria. CBI: US 14th Air Force attacks multiple areas throughout China. CBI - Burma: Day 55 of 99 of the Battle of Pakokku and Irrawaddy River operations in central Burma. The US 10th Air Force provides air support. CBI - China: Day 2,824 of 2,987 of the 2nd Sino-Japanese War. PTO - Japan: US 20th Air Force B-29s attack the Mitsubishi aircraft engine plant at Nagoya. PTO - New Guinea: Day 459 of 597 of the Battle of New Britain. US 10th Air Force provides air support. PTO - New Guinea: Day 343 of 481 of the Battle of Western New Guinea. US 10th Air Force provides air support. PTO - Philippines: Day 162 of 299 of the 2nd Battle of the Philippines, aka the Liberation of the Philippines or the Philippines Campaign. PTO - Philippines: Day 106 of 244 of the Battle of Luzon. 5th Air Force provides air support. PTO - Philippines: Day 21 of 159 of the Battle of Mindanao Island. 5th Air Force provides air support. PTO - Philippines: Day 13 of 135 of the Battle of the Visayas region. 5th Air Force provides air support. Germany: Over 1,000 Germans are arrested by the Allied occupation administration for an attempt to re-organize the Nazi Party. General Rose, one of the greatest, most decorated battlefield Armor commanders in WWII, was tragically killed when surrounded by and captured by German troops.